La Costa Valley provides what so many communities desire: perfectly-sized homes, a world-class recreational infrastructure, an outstanding elementary school and a location drenched in sun and naturally cooled by balmy Pacific breezes…did I mention rack rate Mello Roos and an HOA fee that costs less than your monthly cable bill? The Valley Club is the centerpiece to La Costa Valley that was sold with the slogan, “Beverly Hills meets Mayberry”, and is home to mostly upper-middle class families. The Valley Club has social activities, a large swimming pool and two tennis courts. The El Camino Creek Elementary School is located in La Costa Valley. 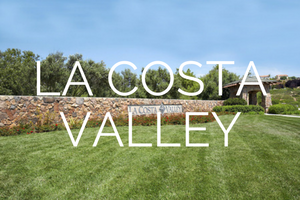 With 123 Acres of recreation and preserved open space, including miles of pedestrian pathways and open space trails connecting neighborhood parks with the entire community, La Costa Valley is comprised of 1,073 single family homes within 11 unique neighborhoods. In addition to The Valley Club and the La Costa Valley Preschool and Kindergarten (both privately run outside the HOA’s management), numerous community sites have been designated to benefit the residents of La Costa Valley including a place of worship, a community garden, an oak tree preserve, recreational vehicle storage and a massive playground.